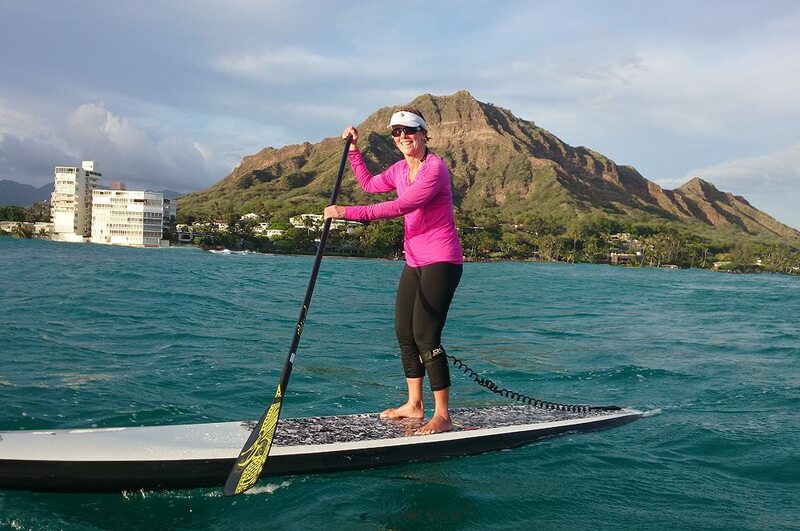 Over the past month we featured SUP athlete (and pianist, and much more) Peggy King as she prepared for the 2014 Maui 2 Molokai race. While she finished 2nd to last with a time of 4:50, that was a 40+ min. Improvement over last year’s 5:34. Peggy was the oldest competitor- and was recognized for that by Rodney Kilborn at the event. And “belong” Peggy did. She put in the time, got solid coaching from Jeremy Riggs and Dave Kalama, so she was ready. Those who know the Pailolo channel know how it when it is somewhat side shore. That can be a bit difficult. For Peggy, it wasn’t that bad. Peggy did M4M the next day and knocked 1/2 + hours off her time for that one too! 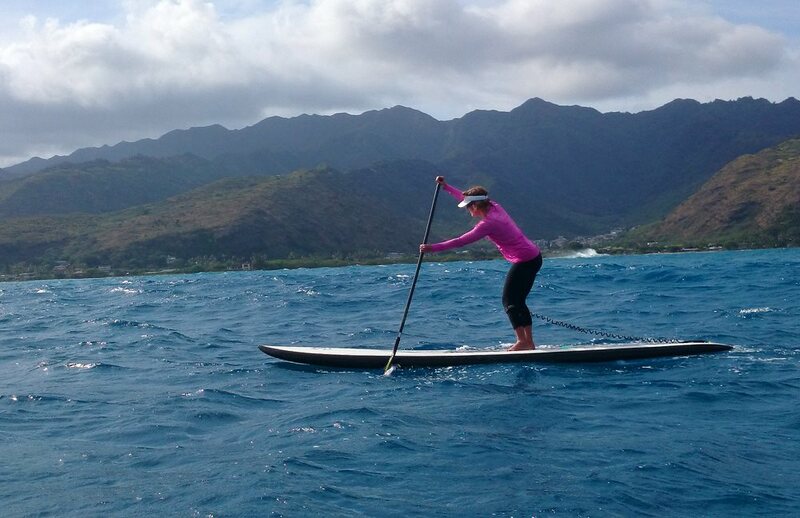 According to Peggy, “It was the most fun SUP weekend experience,ever for me! Special thanks to Rod White, Garfield King and Lindsey Taylor who helped out on the boat and drove me to start line. Props to Jeremy Riggs and Dave Kalama for the coaching. 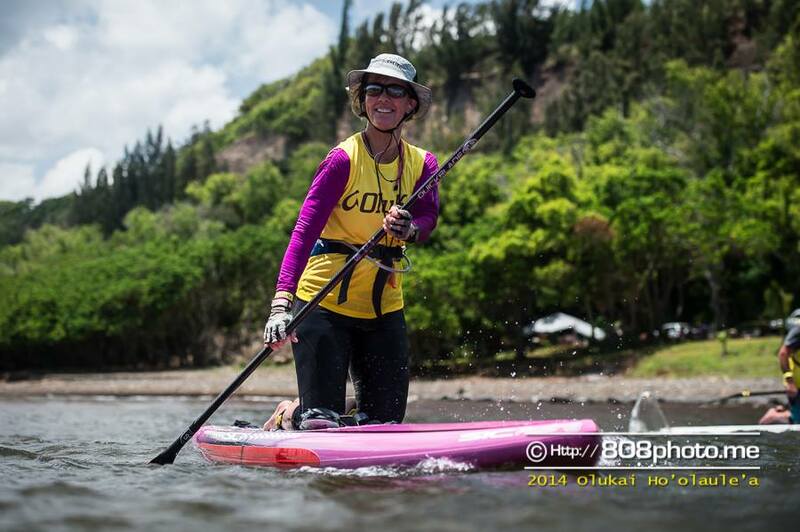 July 12, 2014 – Peggy King will be on the starting line ready for the Maui to Molokai SUP race. 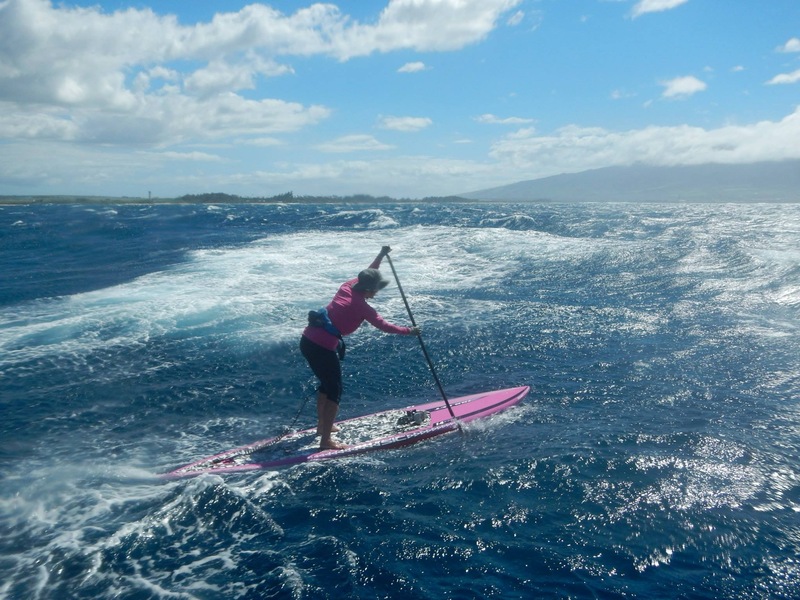 This event, which begins in Honolua Bay, covers a stretch of water often described as “The Best Downwind Run On The Planet.” With her 60th birthday in the rear view mirror, Peggy King’s M2M training had been well-planned and solid. She feels ready for her second solos M2M. 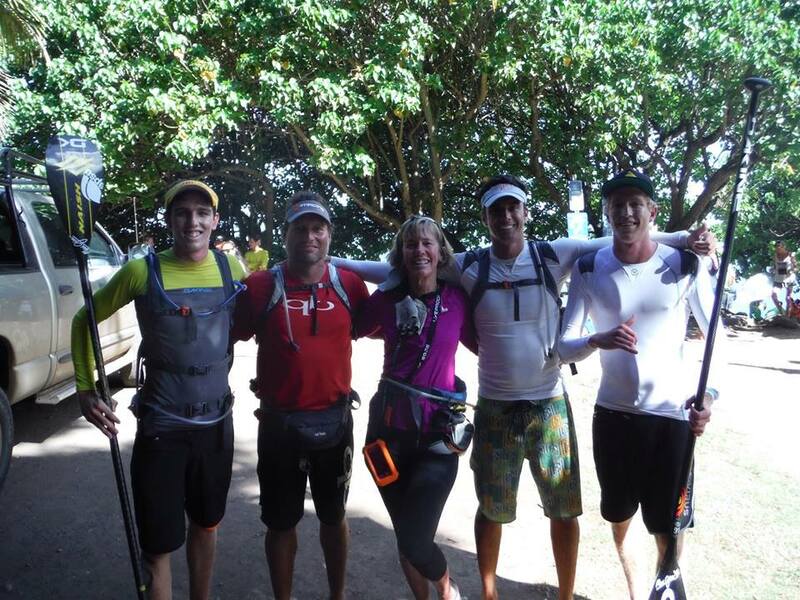 We had a blast at the 2014 Olukai! 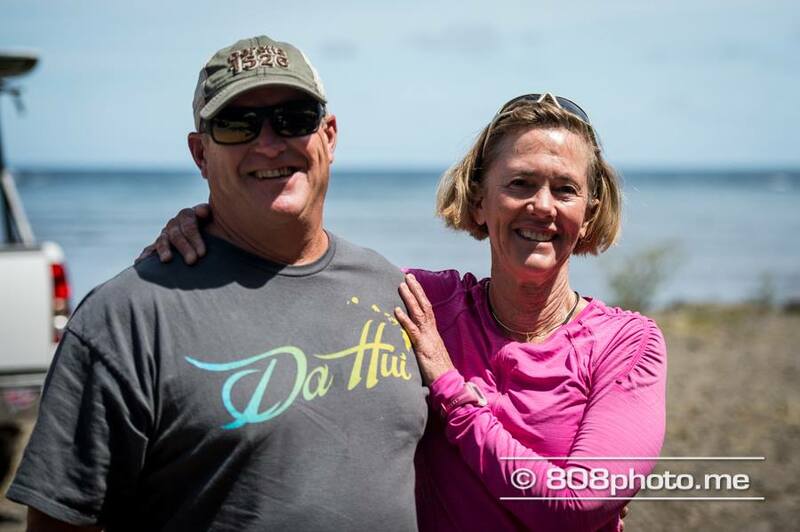 I ran into Peggy at the start of the 2014 Olukai Ho’olaule’a. She looked fit and with 20 fewer pounds on her lean frame she was an inspiration to me! Curious about her training (and ready for some lean muscle and more endurance) I asked her to share some details. 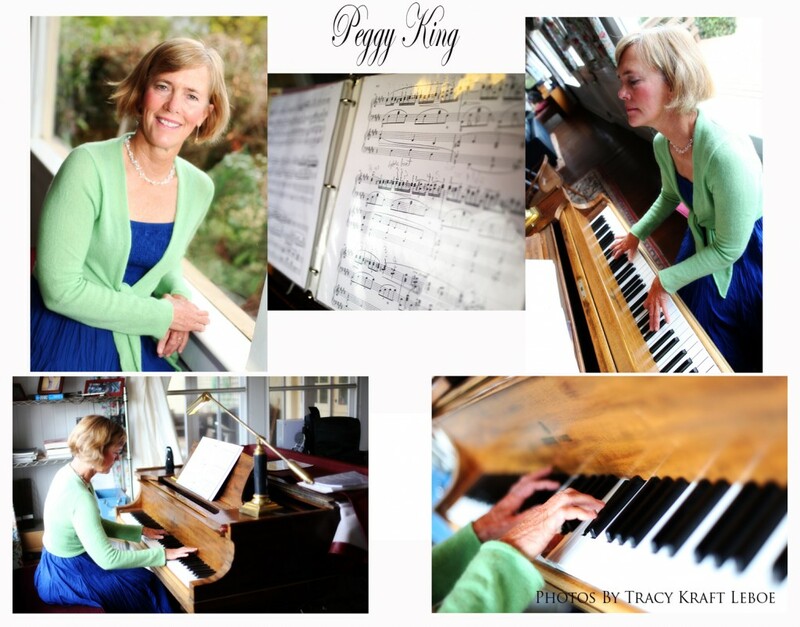 Peggy King’s Training Summary: My training for this event was planned and actually started way back in September of 2013. My main focus was on improving my overall fitness and accomplishing some weight loss( 20 lbs since July 13!) The strategy included attending classes at Crossfit Upcountry Maui 3-4x per week. I am not a nutrition expert, I simply used common sense. For example, my diet plan began with the eradication of a favorite – Triscuits and cheese. It was the start of a few habits changes that made a big difference. Diet was rounded out with meats,veggies fruits, and what we all know is important, less sugar, processed food, and alcohol. Portion control is the magic. Athletes need water – so I was more conscious of that. My XFit class formed a training base that I supplemented with SUP surfing, uphill walking with my dogs, and some double exercise sessions to mimic the time and intensity of e what is required on a double Maliko Run. It was important for me to include scheduled rest days! When I’m tired I overeat, am clumsy and risk getting hurt! Noooo! I do not want an injury. 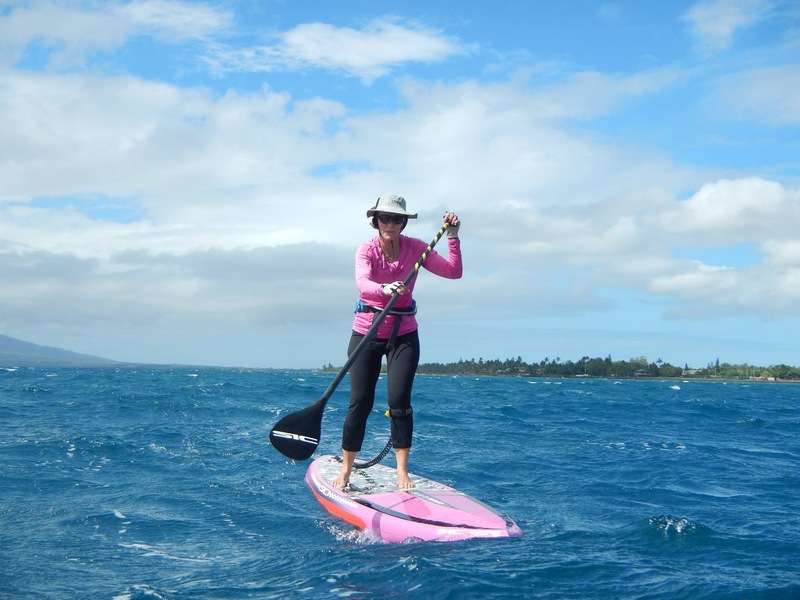 Paddle season is upon us now- I did some of the Kahului Harbor circles in calm water- not fun! I am aiming for a double Maliko run at least 1 x per week. Since February, I have been doing downwinders to the Kahului Harbor(not just ending my Maliko runs at Kanaha) 4-5x per week. Falling during the M2M not only wastes a lot of time, but also energy. Paddling upwind into a body of water in the nasty wind is important- and a skill required for M2O( I’m not doing that one!) and M2M. After paddling 26 + miles of open ocean when you are tired it is necessary to have a solid base of skills and endurance. Jeremy Riggs has helped me with my down-winding and paddling skills for 2+ years now,”being my chaperon” when conditions were really windy and nasty. As a result,my confidence has improved tremendously. I also sought out some wonderful coaching on my paddle stroke from David Kalama. I love and respect both these guys so much! Since paddle/ downwind season has started, I’ve been challenged with the tiredness overeating/ training syndrome,but it’s getting better as my body adjusts to this workload! This is not easy for a 61 year old post menopausal broad like me. I’m feeling both anxious and excited now as M2M approaches. I want to improve my time and qualify as a finisher sooo bad. They let me through last year at 5:34 although I fell a lot the last 5 miles. I did a fair race. This means I didn’t cheat by going to my knees or sitting down. 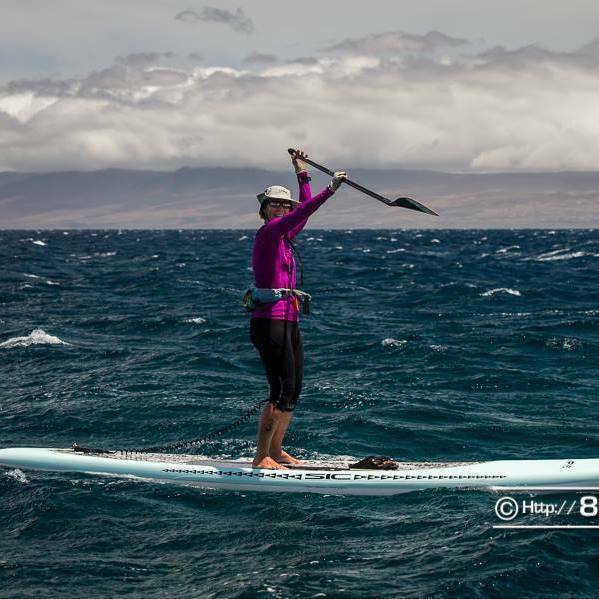 The Maui to Molokai is a 27 mile open ocean event. Maui2Molokai is sometimes thought of as the little brother of the Molokai2Oahu so to speak. 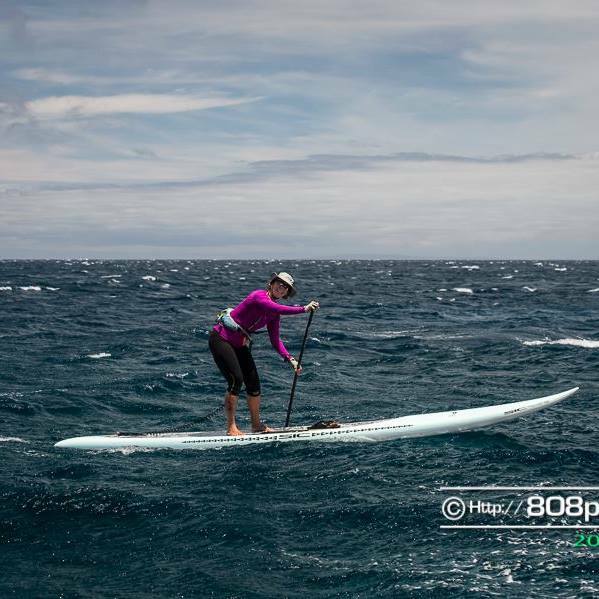 Other than the Kaiwi Channel in the Molokai2Oahu, this race is 10 miles shorter but wind speeds in the Pailolo Channel are known to be the highest in the state of Hawaii. Simply 60+ and having a blast! Time on the water, a dedication to training and knowledge of winds and currents are just the beginning of preparing for such an event. Peggy has a resume documenting just what she needs. She has put in her training time, plowing through the tough workouts that CrossFit has made famous. 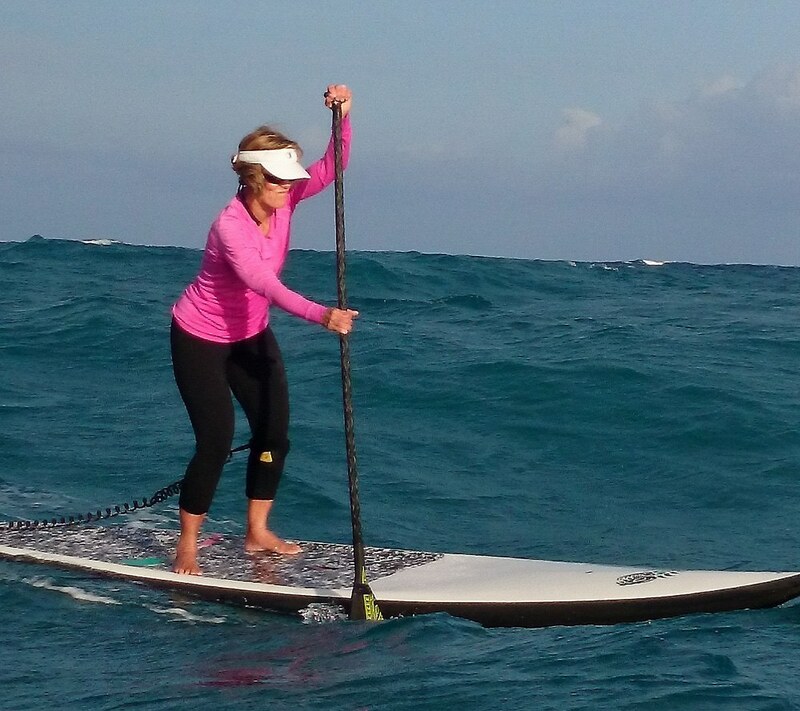 And then there’s this: Peggy was a finisher and the oldest solo competitor in the 2013 Maui to Molokai World Cup of Surfing. Gnarly stuff, that is! If you saw her in her other hats as an instructor in piano and fitness or in her roles working at various elementary schools on Maui and Valley Isle Fitness Center on Maui you may not suspect the waterwoman spirit you’ve encountered. I first noticed Peggy’ name in the results page of the 2013 Olukai Ho’olaule’a. Since I was 64 at the time I was hunting peers in the line-up. Peggy nabbed a first place in the age 60 and over division. 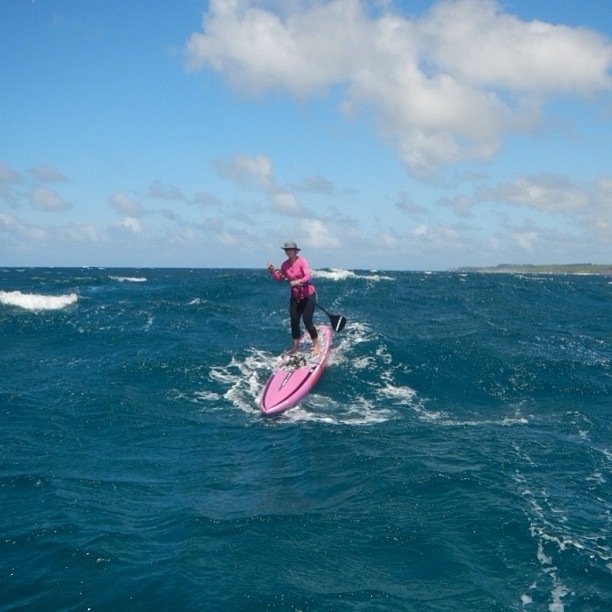 That’s just the beginning of her 2013 successes: 3rd, 45 and over 14′ fixed fin class at the 2013 Maui Paddleboard Championships(Maliko Gulch to Kahului Harbor,9.54 miles) and then add her Maui2Molokai. This is the first in a series of stories about a 60+ “newbie.” She entered her seventh decade earlier in 2013 – welcome to the best years, Peggy! We;ll start with some background and then subsequent posts will follow her through adventures on the water, her challenges along the way and her evolution toward SUP. Why “wonder woman?” Well, no one has yet to see Peggy King and WonderWoman together – only makes us think about it. From upstate New York and a childhood spent skiing on snow and water, Peggy made her way to the University of Denver, CO and met Bill KIng, her husband of 37 years. By 1976 they had moved to Hawaii where they raised their, now adult, son. Peggy’s world of work and volunteering is as diverse as her water sports activities. She taught piano, PE and a fitness instructor working at various elementary schools and at Valley Isle Fitness on Maui over 25 years. Music and animals are true passions and have brought Peggy to serve on music boards and volunteer with Hawaii Animal Rescue Foundation. If you swing by Whole Foods in Kahului you’ll spot Peggy introducing adorable, homeless dogs to their potential new owners. How many of us watched the movie JAWS and were scared out of the water for a spell – Peggy was too! Her venture into the shore break at Baldwin beach resulted in an over-the-falls fiasco that didn’t help her confidence at all. 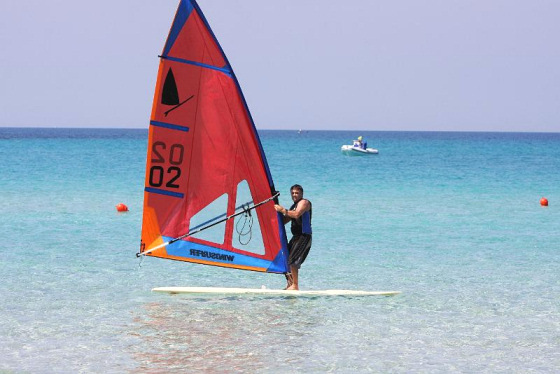 Luckily, two girlfriends introduced Peggy to windsurfing and (lucky break) instructor Mike Waltze. That lesson in 1979 inspired a windsurfing way of life, including Bill’s opening Sailboards Maui with Mike Waltze and Fred Haywood in 1980. Along with Matt Schweitzer and his father, this group worked to develop windsurfing and its equipment into what has evolved today. Mike Waltze racing one of the original windsurf models in a recent competition. In the 1981 Maui to Molokai windsurfing speed crossing in 1981 Peggy was the only woman to compete and finish. In 1984 at the Oneill Invitational Peggy was the overall winner of the wave and slalom events. By 1990 at age 35+ she became Maui County Slalom Champion. To this day I thank BK’s nieces who baby sat my 2 year-old son Gar so I could compete in that event! Our son, Garfield was born in 1988 and raised him with a waterman’s upbringing in addition to school and soccer. Gar and I learned to kiteboard together in 2000 and onward. We truly enjoyed our Mother and Son full circle experiencing wind and water sports on Maui. Watching Gar at Hookipa and the summer gusty winds finally became a bit much and I retreated from the ocean briefly in 2007.